In Extreme Scotland, award-winning adventure-sports photographer Nadir Khan takes us on a jaw-dropping tour through Scotland's epic mountain landscape. Nadir showcases his work with some of the best adventure athletes in the world - including Ines Papert and James Pearson - in a portfolio that has placed him at the forefront of adventure-sports photography in the UK. From the icy walls of Ben Nevis's frozen north face to the raging seas of the north coast, Scotland plays host to world-class adventure sports of every discipline. 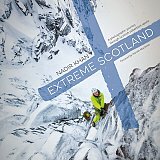 Ice climbing, kayaking, ski-touring, trail running, surfing, mountain biking and rock climbing are all captured beautifully in this fitting testament to Scotland's outstanding landscapes and adrenaline sports. Alongside contributions from climber and author Nick Bullock, Tom Livingstone and Stuart B. Campbell, Nadir gives us an insight into his photographic inspirations, and shares insights and approaches to composition and other elements of his photography.